The question of reclaiming space on NFS based VMDKs popped up while at the Toronto VMUG User Conference. I thought it’d be worth a revisit to this topic – not just from a technical “how to” perspective, but also to discuss exactly what the question is all about, why it happens, and then how to fix it. I’m most familiar with the vendor plug-in model, such as NetApp’s VSC, and have used that to shrink VMDK sprawl, but not everyone has access to tools like that. Thus, I’ll go over the tried and true method for reclaiming space from virtual machines that use NFS for storage. Keep in mind that a storage array that’s able to compress and/or deduplicate the underlying NFS volumes will make this effort largely irrelevant for most situations. Let’s first talk about how NFS disks grow. vSphere’s default behavior is to use thin provisioning for all VMDKs that sit on NFS storage. Without the aid of VAAI (vSphere APIs for Array Integration) and either an API call or storage array vendor plug-in, there’s no way you can change that. Specifically, you’d have to invoke the Reserve Space primitive on the storage array – if it supports this. New to VAAI? Check out a list of block storage primitives and their meanings here. Now, the operating system is reporting that space is used on the disk. This makes sense, right? We just saw that annoying user copy several GB of data to the drive. In fact, 3.65 GB of data to be specific. The guest and vSphere numbers are pretty close to one another. 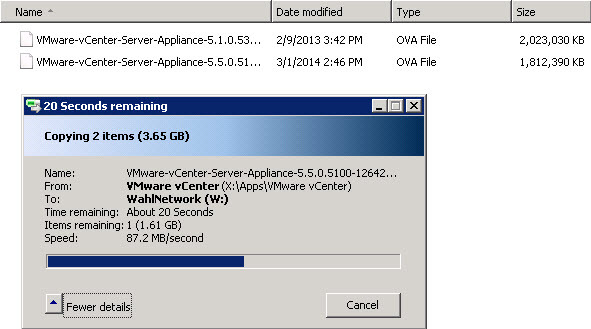 Both the guest operating system and vSphere agree that data is on the disk. But what about when I delete the files from the guest operating system? Let’s compare the numbers after I wipe all the files off the W: drive. As you can see, the guest operating system shows a nearly empty disk, while the vSphere size is still about 3.65 GB in size. The thin disk has grown to accommodate the files that were previously placed on it. It does not, however, shrink back down to size when files are deleted within the guest. When running the tool from the Command Prompt (CMD), make sure you have it running as Administrator. Otherwise you will get permission errors. Using SDelete will cause the virtual disk size to inflate all the way up to the provisioned size. Be sure that you have space for that or stagger your cleanups among small batches of VMs. Inflation of the VMDK file is a temporary thing and is caused by the way SDelete does its magic. The next step will reclaim all of that unused space. vSphere has no native ability to offload a hot Storage vMotion to the NFS storage array without some sort of storage array vendor trickery. The NFS file must be read in and written out over the network. As such, you can use a Storage vMotion to reclaim unused space. In my case, I triggered a datastore migration for just the 5 GB VMDK file on my server to a new NFS datastore. This is because I have no need to move around my primary disk, which is 30 GB. Let’s look under the covers at the network IO during the Storage vMotion. My ESX2 host is busy reading in the used data on the VMDK and simultaneously writing it out to its new home using vmk3 – this is my NFS interface. Once the Storage vMotion is complete – and it should go rather quickly for an empty virtual disk – the results are superb. The VMDK file now uses a mere 30 MB on disk. 30 MB? That looks much better! Don’t forget to Storage vMotion the virtual disk back to where it came from, if you desire. Chris, SDelete is a great tool for simple machines (which we don’t have). The one big failing of SDelete, which makes it almost useless for us, is that it will not work on disks that are mounted at mount points. So in your example, your W drive was just a 4GB drive, and the real storage was on a 32GB drive mounted in a directory on that drive, then SDelete wouldn’t reclaim the space on the mounted drive. I’m not really sure why this limitation is in the program, since every drive letter is just a mount point any way, but unfortunately it just doesn’t work. > curious what your mount points are for – file servers or database servers perhaps? I mount separate disks for data, transactions, backup, tempdb on our SQL servers so that they can go on to different tiers of storage. For our file servers, I have a mount for the home directories, one for the departmental directories, one for scanning, one for software. As well as helping out with the performance, it makes space management better – it’s much easier to work with 4 x 1TB disks than it is to work with 2 x 2TB ones. Our standard template has a stub drive purely for mount points, even if unused – I think the 16GB of thin provision space is worth it. One of our standard mount points is also excluded from backups, so any data that is replicated out to a server goes there and it’s only backed up at the original master location. It’s also worth pointing out this a similar issue affects Linux VMs, and a similar solution is available (using ‘dd’ instead of sdelete). A quick Google should tell you all you need to know. Thanks for another nice blog post and your continuous contribution to vmware community. Just small comment … It is about reclaiming space of thin provisioned vDisk inside guest OS sitting on NFS datastore. Absolutely same trick can be used for block storages (FC, iSCSI). If block storage supports hardware acceleration (aka VAAI) storage vMotion can leverage cloning block VAAI primitive. That’s IMHO advantage of VAAI ready block storage against NFS for this particular use case. That is not the case for me. I have Windows VMs that is present NFS volumes, and the NFS volumes are underpinned by NTFS compressed volumes. While VMware and the OS both agree on the amount of free space, after so many backups to the NFS volumes using vkmfstools, The backups fail and say they are out of space when copying a 37GB VM to virtual disk with hundreds of GB of free space according to Windows and ESXi. You can delete a couple of the backups, but it will still fail. When it fails, it will always fail at the exact same point in the backup. After some days, it will often fix itself and resume backups. This has been going on for a long time. The answer here is what I thought I found at first, but that is not the case. Could you share how to use netapp vsc to shink VMDK ?